Proto readers assess drug shortages' ripple effect, explain how afterbirth is not an afterthought and describe treating trauma. 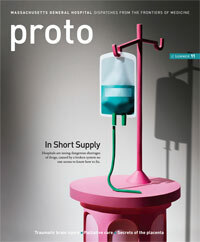 Proto’s comprehensive review of the nation’s drug shortages (“Museum Pieces,” Summer 2011) emphasizes the impact of this crisis on the care of cancer patients. Many of the drugs in short supply are used not only in cancer treatment but in clinical research as well. At New Jersey’s National Cancer Institute–designated Comprehensive Cancer Center, our clinical investigators often design protocols testing new agents in combination with existing drugs. If those existing drugs are not available, the trial may need to be halted. This action delays the opportunity to bring new lifesaving treatments to cancer patients. A bipartisan bill recently introduced in the House of Representatives (the Drug Shortage Prevention Act) calls for an expedited review of drugs that are identified as vulnerable to shortage because of challenges with active-ingredient sources and a limited number of manufacturers. It also mandates better communication between key stakeholders regarding pending shortages. Such actions are needed to help reduce this dangerous ripple effect in which today’s drug shortage is hindering care for today’s patients and the future of cancer treatment. Robert S. DiPaola // Director, The Cancer Institute of New Jersey, New Brunswick, N.J.
Proto’s article “Organ of Change” (Summer 2011) was interesting in highlighting the potential links between placental dysfunction and abnormal neurodevelopment. However, the evidence that the abnormal placenta has a key role in all pregnancy diseases—preeclampsia, fetal growth restriction and prematurity—needs to be emphasized. It is also becoming clear that placental dysfunction is probably a key factor in about half the cases of stillbirth in the Western world. As 1 in 200 pregnancies in the United States and the United Kingdom still ends in this heartbreaking way—a rate that has not changed in more than a decade—the need for more research on the placenta becomes apparent. Proto’s focus on traumatic brain injury (“The Injured Brain,” Summer 2011) offered a hopeful glimpse into the future for people who experience it. But big challenges lie ahead. As our veterans return to work and school following service in Iraq or Afghanistan, primary care clinicians and first responders must be able to recognize signs of traumatic brain injury in patients. It is estimated that one-third of the men and women who served in these conflicts will experience TBI or post-traumatic stress disorder. Differentiating between PTSD and TBI is not easy. Indeed, many of the symptoms are identical and include insomnia, headaches, memory problems, trouble concentrating, irritability and anxiety. Given the stigma veterans feel about seeking care for these conditions, it is important that clinicians be vigilant and aggressive in encouraging their veteran patients to seek care. For the past two years, the Red Sox Foundation and Massachusetts General Hospital Home Base Program have been providing clinical care to Iraq and Afghanistan veterans and families affected by PTSD and TBI. Each day we learn from and are inspired by their resilience. Write to the editor to comment on a story—or offer suggestions for future topics. Drug availability is getting worse, with essential medicines often impossible to obtain. What will it take to fix the system? Though pharmaceutical products are tightly regulated, distributors aren’t, and that has led to a netherworld of dealers ready to exploit—or create—drug shortages.